Looking for a prettier fitness tracker? Check out Mira. It's no longer enough for a fitness tracker to count your steps. It has to look good too (see: Misfit Shine and fancy Fitbit necklaces and bracelets). Now Mira enters the market with a pretty new bracelet. I put the good-looking Mira wearable to the test to see if its function lives up to its form. Mira wins the fitness wearable beauty contest easily. The tracker snaps into a pretty stainless steel cuff (available in brushed gold and deep purple), which looks much nicer than bands made of plastic or silicone. In three weeks of daily wear I received many compliments and questions about the Mira. You can also remove the tracker from the bracelet and clip it to your clothing. I was concerned that the hard, shiny plastic of the tracker—see photo—would scratch, but during my test period it did not. I wore the Mira alongside a Fitbit Flex and found the number of steps they tracked comparable. The Mira makes more data visible right on the tracker than the Flex does. With the Flex, you can only see lights indicating a percentage of daily activity, while the Mira gives you an exact number of steps taken, along with elevation and the distance traveled. I also liked being able to see the time on the tracker. I haven't worn a wristwatch in years and didn't realize I'd missed it so much. One downside to the Mira's tracker is that it can be tricky to get the data to display. You gently pinch the sides of the tracker with your thumb and forefinger to summon the lighted display. This is easy when you have the tracker clipped to your clothing. When it's in the bracelet, it's harder to place your fingers at just the right spots. Unlike the Flex and some other trackers, the Mira is not water resistant, so you can't wear it in the shower. It also does not have a sleep-tracking function, so it's not recommended to wear at night. This is only a problem if you can't remember to put it back on in the morning or after a shower (yes, I am guilty!). As promised, the battery lasted about 5 days. Or you can simply recharge at night while you're sleeping. 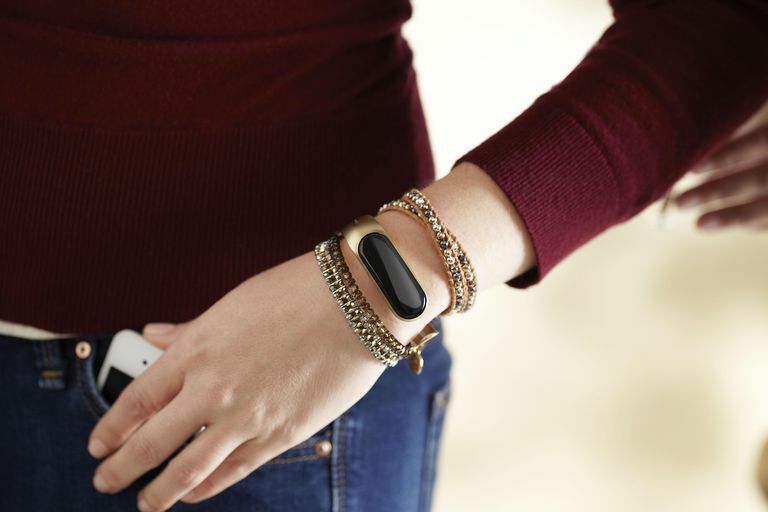 The tracker ($169) comes with a charging stand and one bracelet. With any fitness tracker, the accompanying app is important (Mira's is available for iOS and Android). It's where you'll find more detailed information about your activity—here represented with an attractive circular graph—and a log where you can track your diet as well as exercise not recorded by the tracker (e.g. yoga, Pilates, or swimming). Mira does not offer a social link (where, for example, you can see how many steps your friends have taken, or cheer each other on). Instead, it has baked-in "Boosts" that give you a little motivation anytime you want it. Click on the button that says "Need inspiration?" and you'll see a suggested activity that's short, but will burn some calories or just jump-start your physical activity for the day. If you don't like the first one you get, scroll through until you find one you like. You can also store your favorite boosts to come back to them easily.